I wish the rest of my life were this simple! You folks are top-notch! Our Vitamin E contains a blend of natural alpha, beta, gamma and delta-tocopherols. 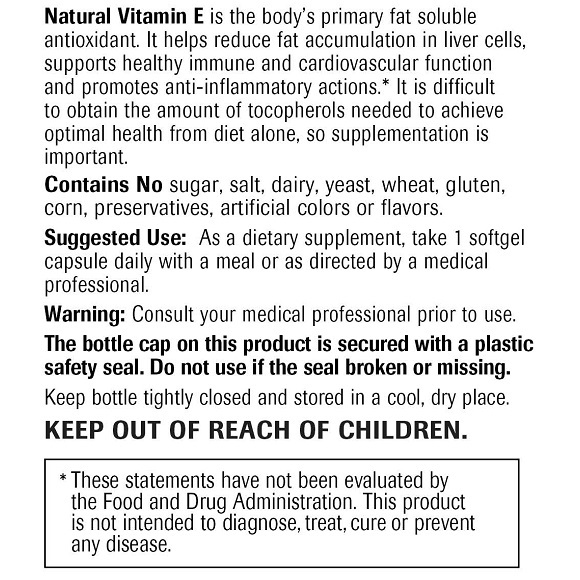 Synthetic vitamin E is chemically produced from petroleum byproducts. 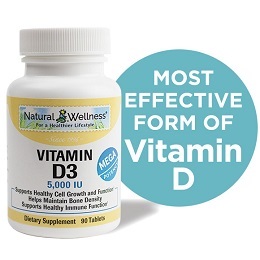 Unlike most vitamins, the natural form of Vitamin E is very different from the synthetic form of vitamin E. Compared to natural vitamin E, synthetic forms are generally poorly absorbed and quickly flushed out of the body like a toxin or unknown chemical. As an antioxidant, natural vitamin E is about twice as potent as synthetic vitamin E.
Those with a compromised liver may not be able to absorb enough vitamin E to support the body's needs and supplementation is highly recommended. The liver is where most of the body's vitamin E is stored and it's responsible for circulation and delivery of vitamin E to your body's tissues. Furthermore, studies show that Vitamin E helps to reduce fatty accumulations in liver cells. 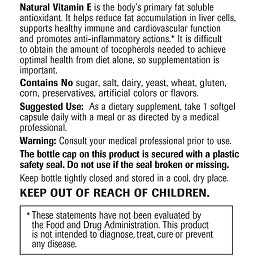 Vitamin E cannot be produced in the body. It can only be absorbed from food and supplemtation. Alpha-tocopherol is the most recognized form of vitamin E and has the ability to work in the body as a lipid soluble antioxidant, protecting cell membranes from free radical damage. Other tocopherols, beta, delta and most importantly gamma, are related but are distinct compounds with a somewhat different antioxidant range. They complement and enhance the activity of alpha-tocopherol. Several studies indicate that mixed tocopherols are more effective than alpha tocopherol in quenching free radicals and preventing disease. Furthermore, only taking high doses of alpha-tocopherol alone, have been shown to reduce levels of gamma-tocopherols. Gamma-tocopherol is an antioxidant that inhibits the production of free radicals and has also been shown to have anti-inflammatory effects. Gamma-tocopherol also helps cardiovascular function by supporting nitric oxide metabolism in the body. Nitric oxide is of critical importance in the dilation of blood vessels. Delta-tocopherol has the highest in-vitro antioxidant activity of the mixed tocopherol family and is also an anti-inflammatory. Beta-tocopherol protects against free radicals, toxins and chromosome damage. Beta-tocopherol helps to strengthen the immune system by energizing cells, blood vessels and connective tissue. 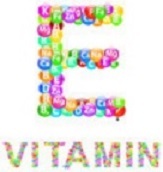 Vitamin E is an antioxidant that protects your cells from damage. This essential nutrient must be obtained from food or supplements. Vitamin E is fat-soluble, which means your body stores and uses it as needed. It also works effectively in parts of the body where lipids (fats) are located, such as the cell membrane, where it helps protect the fats in the membrane from free radical damage. Protecting the cell membrane is critical for maintaining the overall health of all body cells. 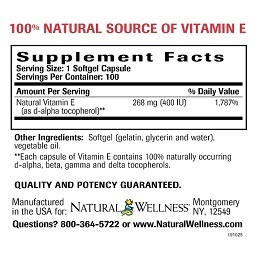 Vitamin E also helps support healthy immune and cardiovascular function. All vitamin E from Natural Wellness® is natural vitamin E. Synthetic vitamin E is chemically produced from petroleum byproducts. 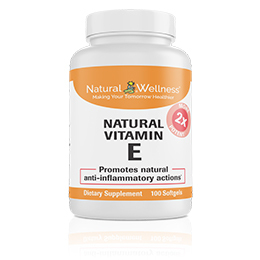 Unlike most vitamins, the natural form of Vitamin E is very different from the synthetic form of vitamin E. Compared to natural vitamin E, synthetic forms are generally poorly absorbed and quickly flushed out of the body like a toxin or unknown chemical. 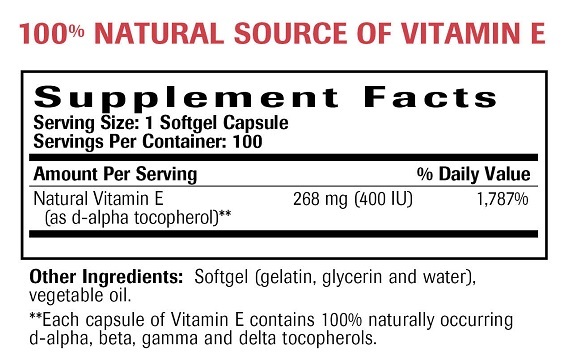 As an antioxidant, natural vitamin E is about twice as potent as synthetic vitamin E.
While alpha is the most well known and most researched member of the vitamin E "family", other tocopherols possess unique characteristics that complement the biological effects of alpha-tocopherol. 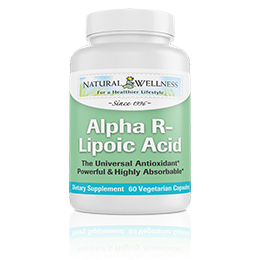 This formula contains a high amount of alpha-tocopherol along with smaller amounts of beta, gamma and delta-tocopherols for a synergistic effect. 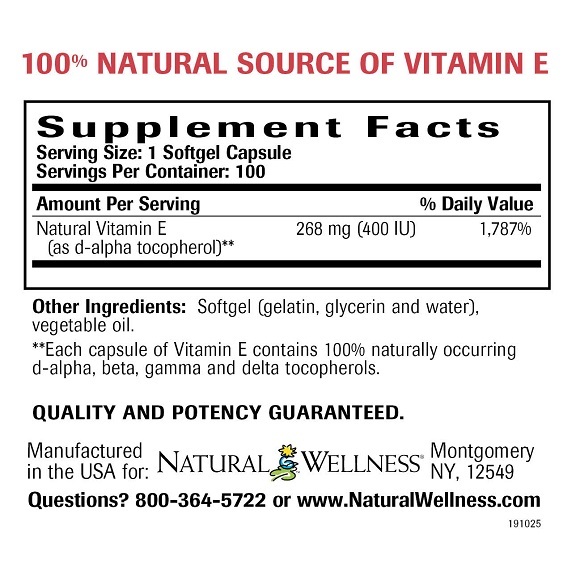 Natural Vitamin E is MANUFACTURED in the USA to meet FDA strict current Good Manufacturing Practice regulations (cGMP).